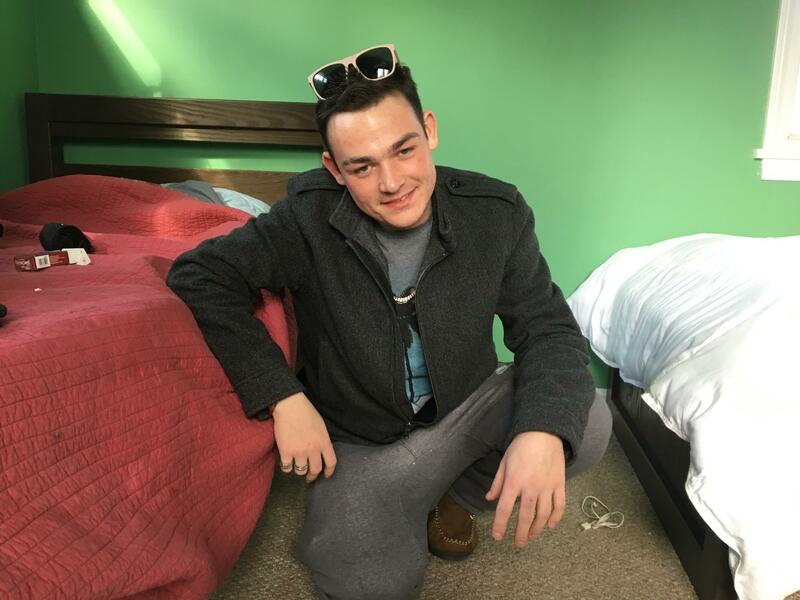 Joseph Schoepplein, 22, at his sober house in Falmouth. This is part two of a three-part series examining the pressing need for sober houses, their importance in the addiction-recovery journey, and the challenges they can pose for communities. All the stories can be heard here. He’s been clean and living at a sober house in town for just over a month, after relapsing last year. Vivitrol is a drug that will block the effects of opioids in his system. It’s been prescribed to help with his addiction. "Some people think they're all good, and they're never going to use again, and all the sudden it's in front of them and it's a different story. And I can relate," Schoepplein said. "But now, if someone had it in front of me, I'd say to myself, 'Even if I wanted to do that, I can't, because there's no way I'd even feel anything.'" Schopplein has been struggling with recovery for the last three years, since he was 19. But he said he’s always had an intense personality. Before it was drugs, there was always something else. And by the time he was in high school, he was into heroin. "The first thing I ever got addicted to was wrestling action figures," he said. "I wanted every set, and we'd go to Walmart every day to see if there was a new one out. Then it was magic tricks, I wanted to be a magician. I was a total addict in things that weren't drugs." Schopplein’s journey to recovery shows the importance of a good sober house. Before he relapsed, he was at a different house, one where a lack of rules and oversight made it possible for residents to get away with using opioids. "I stayed at that house for a year, and I left and I went back out, and when I came back, I honestly just went back to that house because I knew that I could do whatever I wanted," he said. For him, going to narcotics anonymous meetings is an important part of recovery, and his current house requires he attend a certain number of these a week. His boyfriend, Thom Greve, has been with him through his first round of rehab, and subsequently his relapse. Greve says living with an addict freshly out of treatment can be hard, because he can’t always provide the supervision Schopplein needs. "As an addict, the natural reaction is to hide it, to keep it from me. So I don't really ever know when [he's using]," Greve said. "I tend to find out later when he sits down and says, 'I have a problem, let's go get help.'" At Schoepplein's current sober house in Falmouth, which he says is well run, he shares a bedroom with one other resident. The walls are light green, and the room is tidy, with twin beds on opposite sides. He thumbed through colorful tags he’s collected from Narcotics Anonymous meetings. He keeps all of them on his keychain, including his nine-months-sober tag as a reminder of where he once was. "The year one is glow in the dark," he said. "So let's hope we get there." His boyfriend Thom Greve said he felt optimistic about this time. "We were driving the other day, and he was talking about maybe becoming a house manager at a sober house. I stopped him, and I said, 'Joe, I don't know if you realize this, this is the first time I've heard you stop and talk about the future, anything beyond today.' And I'm like, 'That's a big deal, I'm proud of you.'" Greve said. "That does say to me that something is different this time." Schoeppline is currently two months clean. Eventually, he hopes he’ll feel strong enough in his recovery to move out of his sober house, and move in with Greve. This is the second part in a three-part series about sober houses on the Cape. Tomorrow, we’ll look at what it means for a neighborhood to have a sober house nearby.